In 2013, NQBP commissioned a study on behalf of Dalrymple Bay Coal Terminal and BMA Hay Point Coal Terminal on the environmental dust concentrations in the region surrounding the Port of Hay Point. The study collected three different sample sizes of dust in a 15-month period at five sites from Salonika Beach to West Mackay. The three sample size ranges were TSP, PM10 and PM2.5. In total at each site, 38 samples were collected for TSP and PM10 and 24 samples for PM2.5. All the samples were collected over a 48-hour period so that sufficient sample volume could be collected for analysis. Sample analysis included anion and cation analysis, as well as petrographic and microscopic analysis. These analyses permitted the sources of the dust to be identified and characterised as coal, minerals or plant and insect matter. To learn more about TSP, PM10 and PM2.5, read about airborne particles on the Queensland Government website. Does coal dust contribute significantly to the local atmospheric dust concentrations? If so, does the contribution vary with the dust particle size fractions (of particular interest is the contribution to the PM2.5)? What are the potential health risk implications for the local community from these dusts? 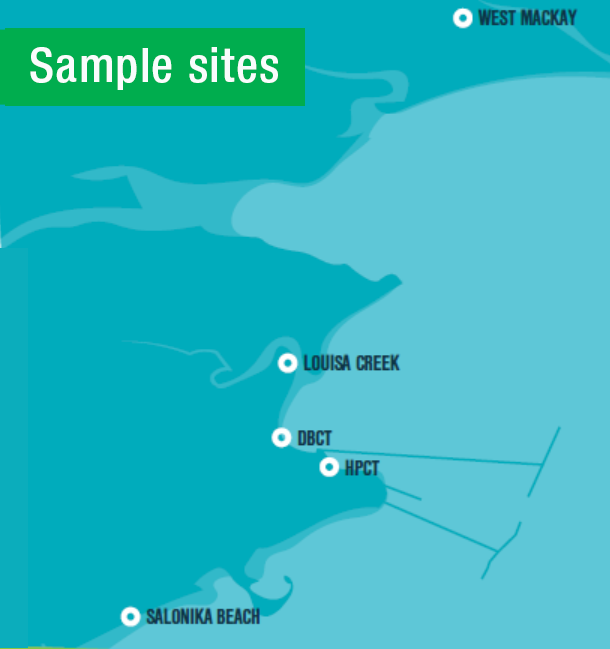 Key findings from the coal dust study can be broken up into those from the three community monitoring sites at Louisa Creek, Salonika Beach and West Mackay, and those from the coal terminal monitoring sites. No community sites detected PM10 or PM2.5 concentrations in excess of the U.S. National Ambient Air Quality Standards (NAAQS) 24-hour PM10 standard or PM2.5 advisory standard. 75% to 95% of the dust by mass at all three community sites was made up of insect or plant matter. The black colour of dust can be made up of soil, soot, mould, diesel particulates and coal. At Louisa Creek, only three samples out of the 24 PM2.5 samples exceeded 10% coal dust, the maximum being 37%. At Salonika Beach and West Mackay, maximum coal dust was 25% and 5% respectively. At all three community sites, the highest dust concentrations measured corresponded to coal content of less than 5%. On average there was a slightly higher contribution of coal to the overall dust concentrations in the larger particle size fractions. This is consistent with the findings of the literature that mechanical processes create very little fine dust (PM2.5) in comparison to the larger dust sizes. There was a correlation between the coal content of the measured dust and the percentage of the time that the wind was blowing from the coal terminals toward the monitoring sites. At Louisa Creek this occurred for all particle size fractions, while at Salonika Beach for PM10 and TSP. No significant correlation was found for the West Mackay site due to the low concentrations of coal dust found in all size fractions at this site. The concentrations of dust measured in the community compare favorably with comparable data from other locations in Queensland and interstate, as can be seen in the charts below. On only two occasions out of 38 did the PM10 concentration at the Hay Point Coal Terminal exceed the NAAQS. No measurements exceeded the PM2.5 NAAQS 24-hour advisory standard. All sites around the coal terminals showed a strong correlation between TSP and PM10. This allowed an empiric relationship to be determined that could then be applied to the data from the continuous TSP monitoring system in the region. At the two coal terminal sites, the dominant source of dust was coal, across all size fractions. In summary this study does not indicate that coal dust from the coal terminals would be a significant contributor to any respirable dust-related health issue in the local community.